Real Madrid boss Zinedine Zidane conceded Barcelona are deserved La Liga champions after losing out to their arch-rivals by one point. Real won their last 12 league games, but Barca ended with five victories in a row after a blip in April saw their lead over Real closed from 10 points. "We're all disappointed, but with 38 matchdays played, we can't change anything now," said Zidane, who has won 21 of his 26 games in charge. "Barcelona deserved to win La Liga." Luis Enrique, who has won the title in both his seasons in charge of Barcelona, agreed with his rival. "It was a deserved title which shows that the team knows how to bounce back from a bad spell. "We played very well over the full season, we were on top of the table for many weeks and the most consistent team wins the title." Captain Andres Iniesta has now won eight La Liga titles, a third of Barcelona's total league championships. 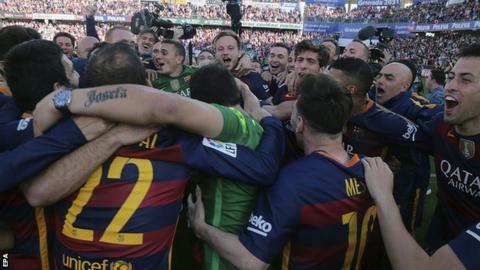 Barca have won six of the last eight titles - including two in a row. "La Liga is glorious," the Spain midfielder said. "It is the competition of stability, the one we are able to win year after year. Whenever you win the league, it is a great season." Defender Gerard Pique said: "This is a historic time for the club. This is a unique generation of footballers with loads of talent and who are achieving things that have never been done before. "We had a negative run that meant we had to fight right to the last, but we got our prize in the end." Both sides have a cup final yet to play. Barca face Sevilla in next Sunday's Copa del Rey final, while Real face city rivals Atletico in the Champions League final on Saturday, 28 May.